During the Ocean Keys Shopping Centre construction, the Public Transport Authority has relocated a bus stop on Ocean Keys Boulevard from outside the old centre entrance. The temporary replacement stop sits about 160m away, near the traffic lights in Marmion Avenue, but the bus shelter is lying on its side, unused, inside the construction site. Butler MLA John Quigley’s electorate officer Lisa Wallis said she had received plenty of complaints from residents who wanted to catch the bus, mostly complaining about being exposed to the elements without the shelter. ‘They have got that one lying around there doing nothing,’ she said. ‘We have had a lot come into the office, and we have had people call us. A PTA spokeswoman said the shelter was the City of Wanneroo’s responsibility, and the Times understands the City recently placed a bench and rubbish bin at the temporary stop, but did not plan to install the shelter there. Ms Wallis said although PTA’s only other choice would have been to remove the stop until construction finished, she also had safety concerns for residents who had to cross several busy roads to get to the temporary stop. Another sign of the disruption is shopping trolleys left around the stop by people who have caught buses. ‘That is a long walk when you have got groceries,’ Merriwa resident Mary Newton said. 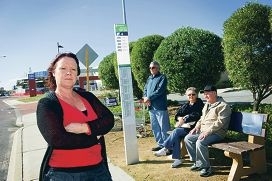 The City of Wanneroo did not respond to questions before the Times’ deadline.